Thumper is a Netherland Dwarf Rabbit that is 8 and old. She is very loving, kind, and caring. She loves to hop on you and can't get enough attention. 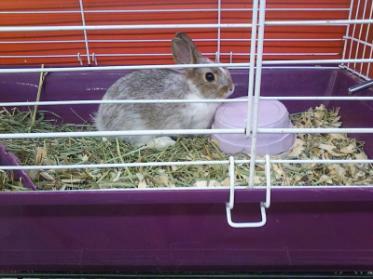 "Chloe" is a 4 month old baby rabbit, that will soon be in our family. She is a Multi-Colored Dwarf bunny. -The Picture was taken on my phone and I took it of her at the pet shop. They are usually together (the bunnies) in a octagonal like pen, but she was getting harassed with 2 other boys. She is now alone in a cage at the store waiting for me to pick her up.